Hi there. Just a quick note to share a new recipe I made this week. 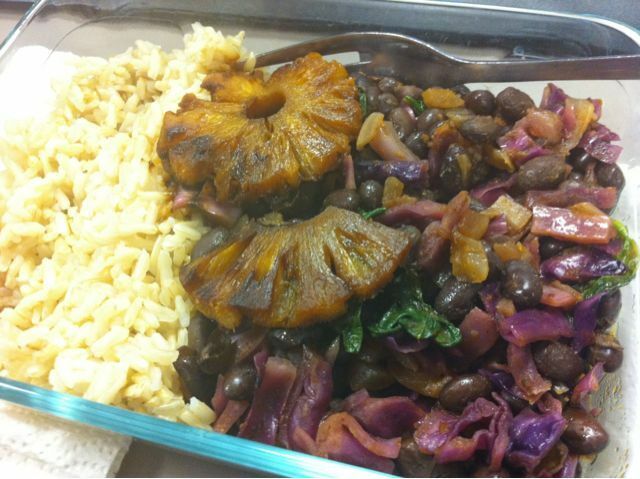 It’s another great rice and beans recipe from No Meat Athlete. The first one I made was Baltimorean Rice & Beans which I mentioned in one of my meal plans. I’ve made it several times and Benzo and I really like it. 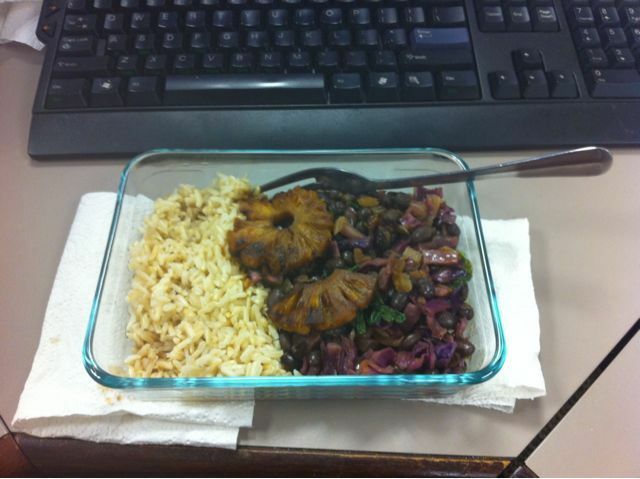 A few weeks ago a new recipe popped up in my Google Reader – Hawaiian Rice & Beans. Since Benzo and I went to Hawaii this summer, the recipe seemed appropriate. I’ve been wanting to try it ever since and finally got around to it last night. I know I’m eating at my desk. Not a good habit. I promise I don’t do this everyday. I had a conference call scheduled at 12:30 so I didn’t have a lot of time to eat. I made the recipe as written except I didn’t have time to find the smoked paprika. I’m sure I could’ve gotten it at this spice shop in town but I didn’t get a chance to get over there beforehand. So instead I used regular paprika and a little bit of liquid smoke. Below is a closer shot. The fried up pineapple was AWESOME. Benzo and I gave this dish two thumbs up. I really liked that it had different ingredients and a different flavor. 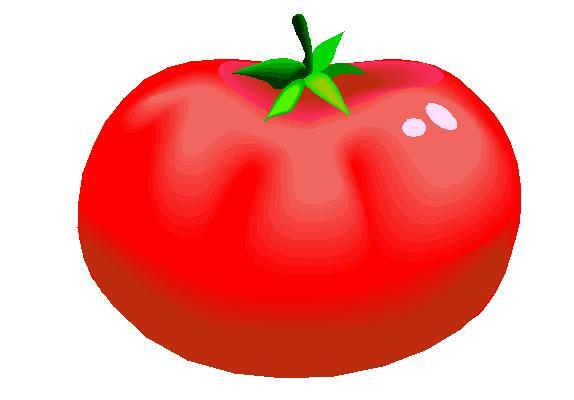 Whenever I think of rice and beans I think of Mexican food. So this was a nice change. Benzo thought it tasted just like Hawaii but I was a little iffy on that part. I mean it was good, but it wasn’t like being in Hawaii (nothing is!). The dish was enough for two people for dinner with enough leftovers for lunch for us both the next day. I will definitely make this again and probably soon as I still have 3/4 of a head of cabbage to use up!